WAVESPEECH is an artist-signed and numbered publication in a limited edition of 200. It explores a remarkable collaboration between artists Edmund de Waal and David Ward. De Waal is internationally renowned for his installations involving porcelain vessels and other materials, and David Ward is a wide-ranging artist working in paint, photography, light, and sound. Both work with texts. 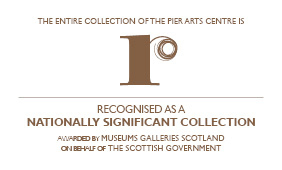 Together they produced new, individual and interrelated works that responded to the architectural space of the Pier Arts Centre, the artworks in its collection, and the seascape/landscape of the Orkney Islands where the gallery is sited. The publication celebrates this unique collaboration, and includes a fold-out version of a collaborative large scale wall text. The original site specific version is now in the Pier collection. The book also includes a new poem by award-winning writer Rhona Warwick Paterson. Sold solely through the Wunderkammer Press website or at the Pier Arts Centre.